This year (2016) the Early Music Festival in Utrecht will pay special attention to the sacred music of Antonio Vivaldi. There is every reason to do so: Vivaldi is one of the most frequently-performed composers these days but it is especially his instrumental oeuvre which is given attention. In recent years his operas have also met with considerable interest. Among his sacred works a handful are well-known and regularly performed, such as the Gloria in D (RV 589) and his Magnificat in g minor (RV 610). There are also some works for solo voice which singers have included in their repertoire, for instance the Stabat mater (RV 621). However, those pieces are only a very small proportion of what has come down to us and it seems likely that a substantial part of his sacred output has been lost. A part of his sacred oeuvre dates from the time he took over the task of maestro di coro at the Ospedale della Pietà, from 1713 to 1719 and again from 1737 to 1739, when that post was officially vacant. Therefore it can be assumed that most of his sacred compositions were meant to be performed by the girls from the Ospedale. This explains why the solo parts are almost exclusively for soprano and alto. However, during his travels as a violin virtuoso he must have received several commissions to compose sacred music. The present disc mixes pieces from two genres within the corpus of sacred music: liturgical works for four-part choir, strings and bc and motets for solo voice, strings and bc. The three short Psalm settings date from several periods in Vivaldi's career. Laudate Dominum and Laetatus sum are from the first period of sacred music writing whereas In exitu Israel was written for Easter 1739. Even so there is no real stylistic difference. These are all short and pretty straightforward settings of the Psalm texts; their brevity leaves few opportunities for word-painting or giving special attention to single words or phrases. They are nice enough to listen to but would probably make a better impression if they were embedded into a liturgical framework. Motets were pieces with an extra-liturgical text in Latin which were to be performed during Mass (Offertory, Elevation and Benediction) or Vespers (between two Psalms). It was part of the duty of the maestro di coro to compose at least two motets a month. If Vivaldi had lived up to this part of his contract he would have written many more motets than have come down to us: twelve are extant, two of which are incomplete. Stylistically they are close to the secular cantata: they comprise two da capo arias embracing a short recitative and end with an extended "Alleluia". The fact that motets were usually meant for performance in a liturgical context doesn't mean that every single motet in Vivaldi's oeuvre was performed in church. Even if they were written for the church they could be performed in another context. O qui coeli terraeque serenitas was composed in Rome during Carnival in 1723 or 1724. It is likely that it was written for an opera singer and considering the strict rules in Rome in regard to liturgical music it seems doubtful that it was performed in church. It could well have been performed at some palazzo. In turbato mare irato has been preserved in the archive of the Dresden court chapel and is one of two collected by Jan Dismas Zelenka who played double bass in the orchestra. The congeniality of motet and cantata comes to the fore in the opening aria: "In the turbulence of the angry sea sweet peace is shipwrecked". Such images were often used in cantatas and Vivaldi regularly was inspired by the sea and its turbulence in his composition of concertos, such as La tempesta di mare. There are strong parallels between such concertos and the way this aria is written. Vestro Principi divino probably dates from 1715 and was likely written for Holy Week as the text paraphrases parts of Psalm 23 (24) and quotes parts of the rite of the Paschal Virgil. The rather narrow vocal range of this piece can be explained by the fact that Vivaldi likely had a specific singer in mind whose tessitura was not very wide. The second aria is unusual in that it is in three stanzas. In this recording it is followed by an alternative which has the form of the traditional da capo aria. The work-list in New Grove includes no indication of its existence. It is rather odd that the liner-notes don't discuss it; we are completely left in the dark as far as the source or the date of composition of this alternative aria is concerned. There is also no mention of the fact that the motet Invicti bellate has survived incomplete. That is probably the reason it was omitted from Robert King's recording of the complete sacred works by Vivaldi for Hyperion. It has been reconstructed for the recording by Anke Herrmann and the Academia Montis Regalis (Opus 111, 2003) but whether that reconstruction has been used here is anybody's guess. It is another motet which opens with an aria which could also be part of a secular cantata or an opera. That is no excuse to sing it with a lot of vibrato as Claide de Sévigné does here. That is the more surprising as in the second aria and in her other motet she keeps it much more in check. The opening aria from O qui coeli terraeque serenitas is very well done. However, in both motets - and that goes for the alto motets as well - the recitatives are rhythmically too strict. Moreover, in the da capos Ms de Sévigné exceeds the tessitura of her parts which at the time was considered undesirable. That is also the case in Vestro Principo divino which is all the more regrettable as Vivaldi seems to have intentionally limited the range of this part. This should have been observed by Maria Soulis. I am not that impressed by her performances anyway. Her incessant vibrato is hard to swallow and completely unjustified. However, she delivers an expressive performance of the opening aria from Invicti bellate. The playing of the Aradia Ensemble is disappointing. It lacks profile and is pretty bland in the 'storm aria' which opens In turbato mare irato. 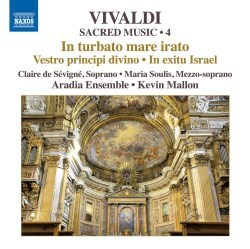 I haven't heard the previous discs in this series but this fourth installment can hardly be considered a significant addition to the discography of Vivaldi's sacred music.